The other night, I traded fellow #Whole30 challenge friend Amy some of my paleo-friendly Bolognese sauce in return for a spaghetti squash. The squash was staring at me on my counter... daring me to go out to eat again and still maintain my willpower. Luckily for my bod, the Bengals-Texans game was so lame, I started looking at recipes. 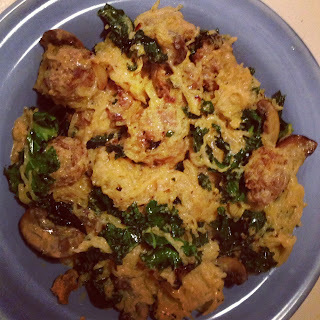 In 2011, I wrote a post on the best spaghetti squash recipes on the web. And then promptly made none of them. As I perused them, three stood out as particularly delicious and easy to make with paleo-friendly ingredients (hat tip Macheesmo, White on Rice and My New Roots.) I took a look at the ingredients in my refrigerator and came up with this little number that was so awesome, I would order it in a restaurant even if I could eat carbs. 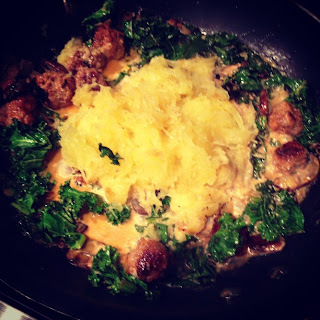 I didn't plan to blog this so I didn't measure exactly, but you'll want a half of a large spaghetti squash per serving. Sausage, kale, mushrooms and onions based on your taste, but generally I used a large handful of each. 2. Cut spaghetti squash in half. Scoop out insides. Discard seeds and stringy stuff. Drizzle olive oil on a cake pan. 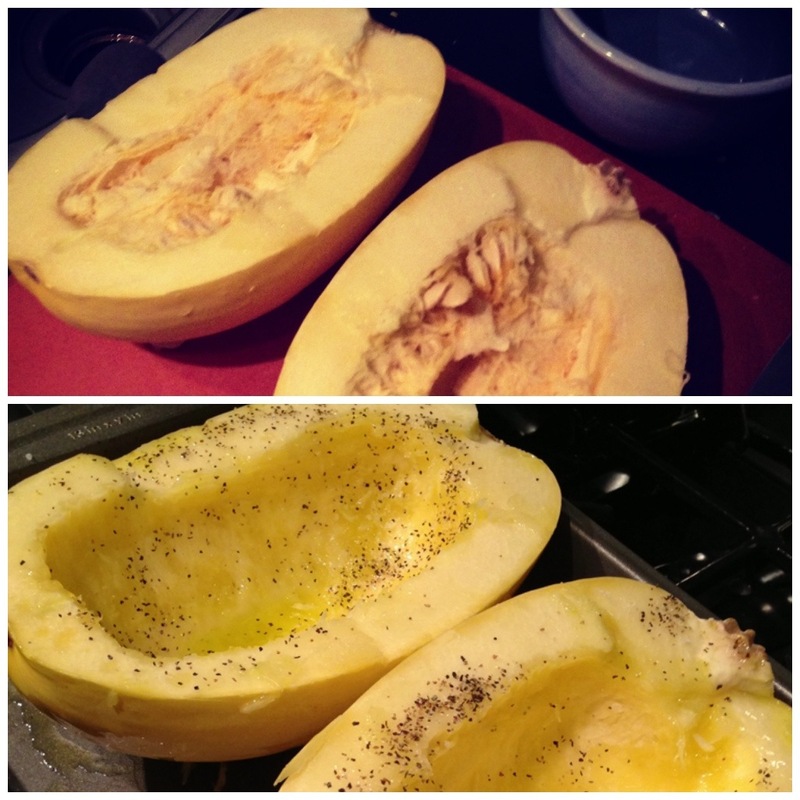 Rub olive oil all over the spaghetti squash and sprinkle salt and pepper on the insides. Flip them over so that they are face down in the pan. 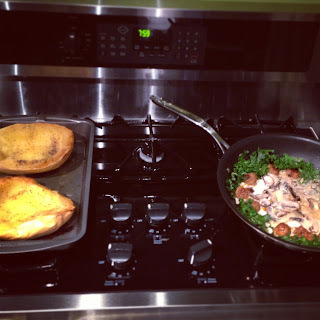 Insert pan in oven and bake for one hour. 3. About 15 minutes before the squash is finished, begin your sauce. Mix your sausage with a light dusting of almond flour to act as a binder. Roll into meatballs. 5. 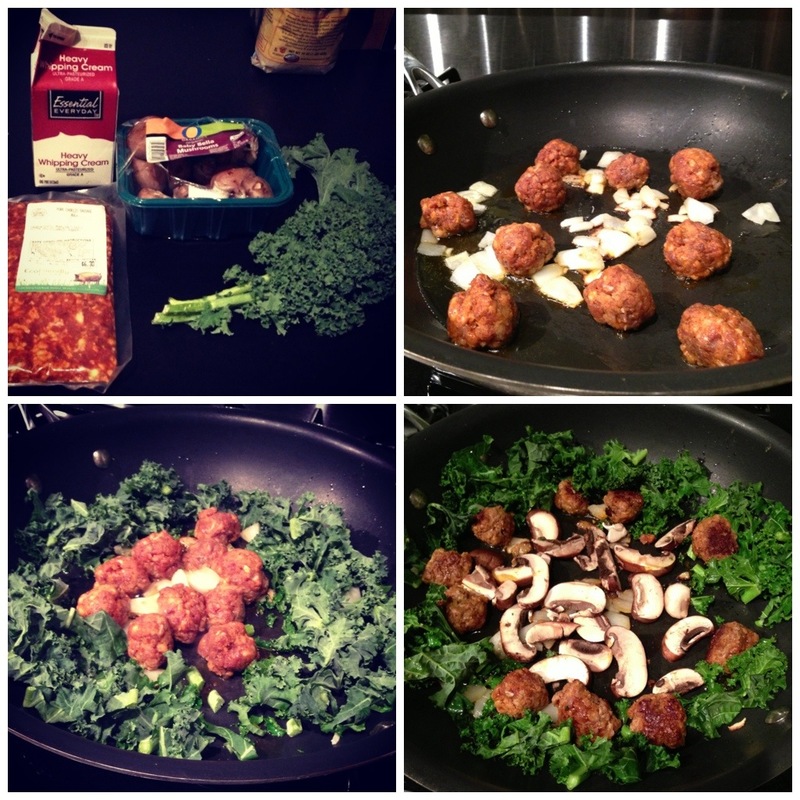 Move the meatballs to the center of the pan and add kale to the outsides of the pan. Cook for 3 minutes. 6. Make a center well and add the mushrooms. Cook a few minutes until the mushrooms begin to brown and caramelize. 7. 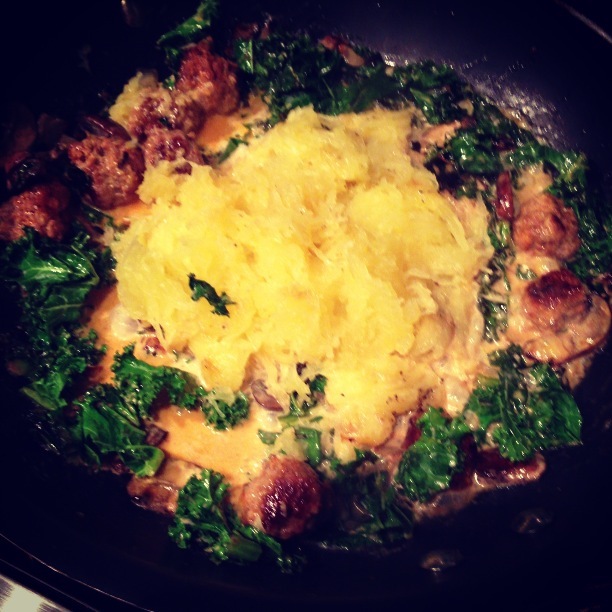 Remove your spaghetti squash from the oven to cool. 8. Add cream to the sauce pan and simmer. After a minute or two, fold all of the sauce ingredients together. 9. Using a fork, scrape the squash so that you have a pile of spaghetti-like threads. Make a well in the center of the sauce pan and add them. 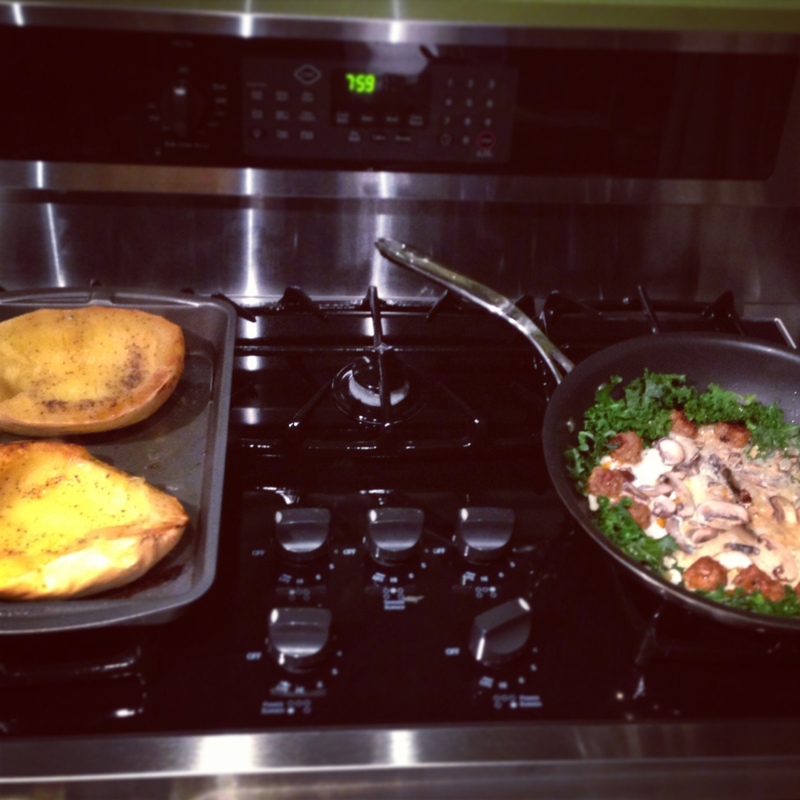 Cook for a minute and then fold all of the ingredients together. Add salt and pepper to taste. Serve immediately. I hope that you'll try this if you're on a no-carb diet. It was decadent, spicy and filling. I'll definitely make it again, even if I'm eating carbs again. PS. I still have one half of my spaghetti squash left. I'm thinking of trying to rock these Paleo Hash Browns for breakfast. Stay tuned.